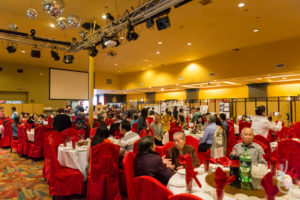 Yesterday was the IBS prison visitation program 23rd anniversary fundraising event. It was another very successful one. 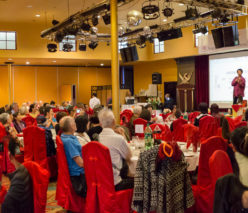 More than 200 people gathered at Jasmine Restaurant to support the IBS Prison Program. I was very touched because there were people who drove down all the way from Los Angeles and Orange County to be part of this meaningful event. IBS is so blessed by these generous and selfless people who have been continuously supporting our program to grow and support our brothers and sisters in the Iron Temples. Social media has been playing a very important role in the IBS Prison Program. 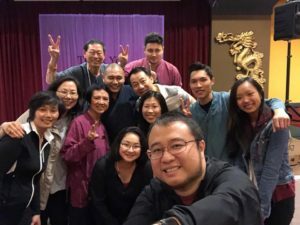 It helps us to connect many kind people all over the world who have same vision about the importance of teaching Buddhism in prisons. I remember 8 years ago when we started the IBS Prison Library program, I did not know where to find the Dharma books for the prison libraries. Through social media, we got to know many organizations and individuals who selflessly donated Dharma books for the prison library program. Today I am pleased to announce that with the contributions of our supporters, we have set up 105 Buddhist libraries different prisons in 4 different states. This year, our fundraising event was so successful not just because of the participation and support from local people but also due to the wonderful support from online volunteers. This year 330 people supported our program. Each table could seat 10 people and we sold out 33 tables in total. 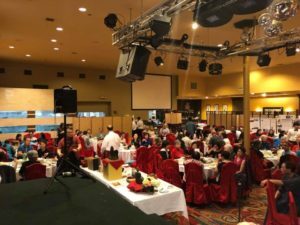 There were 20 tables from California, 7 from Malaysia, 5 from Hong Kong, and 1 from Singapore. Here I would like express gratitude on behalf of all of IBS to Py/ Richard and all supporters from Malaysia; Rame Chiu and all supporters from Seattle and Hong Kong; Sydney and every supporter from Singapore. IBS’ event wouldn’t be so successful without the generous support of all these amazing people. At the same time, I would like to give thanks to all of the local volunteers who spent a lot of their precious time to help make this event successful. First, I would like to thank Nathan and Nerissa for working day and night to finish the video project before the event. It was something different and a very effective presentation this year to our supporters. Many people approached me and gave positive feedback regarding the video. I also would like to thank Julia for spending many days to write the description of each and every auction item, and of course thanks to all IBS local volunteers and members for working so hard to make this event smooth and successful. Again thanks to everyone who has been part of the IBS Prison program. We will keep posting our progress and prison visitation reports time to time. May each and every one have good conditions to practice Buddha Dharma. May all beings be blessed by Triple Gems.